Our clear pouch range is ideal for showing off your products. You can choose from open top pouches, stand up pouches, grip seal pouches and 3 side seal pouches in a variety of sizes. If you are looking for a cost effective and highly flexible solution to your packaging needs, clear pouches are the right choice for you. In addition to providing extra protection for your products – whether they are food and drink or cosmetics and medical goods – stand up pouches are also a great way to ensure your merchandise stands out in a crowded retail environment. What are the uses of clear pouches? 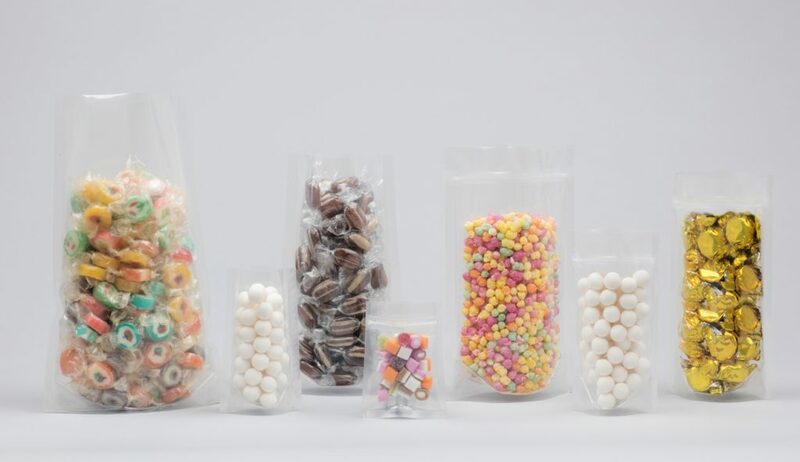 Clear pouches are often the preferred choice of packaging for confectionery and other aesthetically pleasing foods. Colourful candies are especially visible in a clear polypouch, giving you the opportunity to really show off your quality product. In addition to food storage, clear plastic bags are also a great solution for jewellery storage – not only are pouches great for packaging small jewellery items such as beads and clasps, but they are also a fantastic way to showcase your goods if you are selling handcrafted items or simply want to make the colours of your offering really pop on the retail shelf. What are the benefits of a clear pouch? Clear pouches are incredibly cost effective – since they are readily available and there is no need for you to have them custom made, they are the ideal packaging solution for artisan businesses on a tight budget as well as large companies who need large quantities at a lower cost. What’s more, clear pouches are convenient for the end user – customers can unseal the packaging or untie the ribbon, if you’ve chosen to really spruce up the presentation, and access the content. Pouches are also more durable and easier to transport (and store) than other forms of flexible packaging – meaning your products are guaranteed to remain intact throughout the distribution chain. Our clear plastic bags are also highly customisable – you can choose from a variety of sizes, from ‘petite’ bags to pouches of substance, to fit all your different products. You can also choose from a range of features for your clear pouch, such as grip seals, open tops and stand up bases. View our stock pouches for more stock pouch packaging. After something more personalised? Let our team create bespoke pouch packaging for you.